354 Sandia Mountain GPS "waypoints" in GPX (.gpx) format (listed in Appendix 3 of Sandia Mountain Hiking Guide) can be downloaded by clicking on the link below. GPS files stored in the GPX format can be opened by the Google Earth, Garmin Mapsource, and Magellan Mapsend software (as well as many other programs). When you have downloaded waypoints, you should be able to upload them to your GPS receiver (GPSr) using sofware such as Garmin MapSource or Magellan Mapsend. 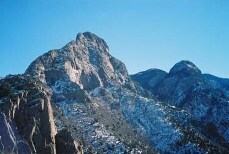 Then, for example, when hiking in the Sandias you can use the waypoints as points of reference to guide your way. Click here to download waypoint file in GPX format.